Yes, it’s been a while. It’s been a weird season in my life. Business has overtaken my world in such a way that I don’t know which end is up most of the time. I feel like I am constantly preparing for the classes we teach, my homework assignments, my family functions, dinner, cleaning, ALL.THE.THINGS. right before they need to happen. I am constantly scrambling to catch up to my life. Most of the time I feel as though I’m failing. Not just failing in my tasks, but failing my kids and my family. Scheduling my time has greatly helped me get my family time back. I try to orchestrate fun family events but end up ruining it because I am so stressed and feel so behind that I can’t even enjoy my family without looking up at the clock and dwelling on how much I could be doing. Or, I would have “family fun time” while I was trying to clean, or empty the dishwasher, or catch up on emails. Needless to say, no one was having fun. Well, obviously that’s not a great way to live. It’s not productive either. I wanted to restructure my days from simple to-do lists to a prioritized way of living. I have to say that this concept is not original from me, but can be modified to fit any type of schedule and personality. Block scheduling is a great way to set boundaries with your life, your family, your work, social life, homework, etc. It allows you to fully focus on one aspect of your life at a time before closing that box and opening another. Being female it’s easy to multitask. Frankly, most of us are amazing at it, but it’s the multitasking that gets us into trouble because we’re not focusing on anything 100%. Most of the time, with kiddos at home, we CAN’T focus 100% on something during the day. A lot of work is getting half done, basically. We need to set boundaries for ourselves, so we can be 100% wife, 100% mom, and 100% awesome when the time is right. 6:00-7:45 am: Wake up, breakfast, getting ready for school. I’m sure you saw my star on my 12-2 pm work time. With this block of time, I prioritize what MUST be done that day. Usually, it’s homework for my grad school classes, but there are times where our businesses or our personal admin stuff (balancing the checkbook, catching up on emails, laundry, etc.) needs some attention. In some cases, it’s a nap! Don’t be afraid to take a few minutes of self-care and rest. This is the whole point of a schedule like this is prioritizing and setting boundaries. If we don’t set boundaries “things and stuff” can take over our lives before we know it. As mama’s we need a few minutes of peace and quiet. Try taking a nap, catching up on a book, taking a bath, reading the Bible or other self-fulfilling books. 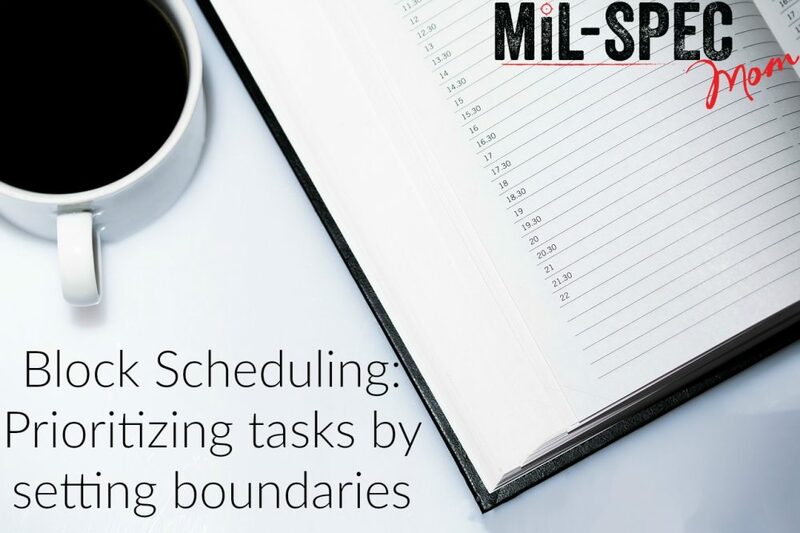 The point of the block scheduling is to set boundaries for your time and your family. I don’t work on homework during dinner prep or try to clean and play with the kids. Block scheduling allows you to be fully present and focused on one or two tasks at a time and be fully there with your kiddos. Now, some people plan out their schedules days or weeks in advance. Yeah, that doesn’t work for me. Normally I plan my day the night before or the morning of while drinking my coffee. It doesn’t have to be complicated, it just has to be segregated and you need to work on the self-control to stick with those tasks within your block. Give it a try for a few days and let me know what you think!